The Good Day Café adjacent to Bedouin, at 143 E. Hood Ave. in Sisters, is open for business. Last May, when Harmony Thomas bought the adjacent women's boutique called Bedouin from Janet Brockway, it presented an opportunity for her husband Brian to return to his roots as a chef. The café is now open for light breakfasts and lunch five days a week, Tuesdays through Saturdays. "The name 'Good Day Café,' was Harmony's idea," Brian said. "When it comes to the front of the house, I let Harmony plan it. I had an idea of what I wanted to do with the tables, but the décor (by local artists) is hers." Currently featured is a permanent display of art by Janice Druian, a panel of miniature illustrations by Maren Burke, and this month's featured art wall, a series of off-white macramé wall hangings by Vineglow. The new décor is bright and cheery, and the food is substantial and well-served. The chili came topped with freshly grated cheese and a little diced red onion. Menu items include homemade soups, sandwiches, light breakfast fare, cookies, banana bread, and barista-made Simply Organic coffees and Townshend's Teas. The café's featured items are frittatas. "I was going to do a daily quiche, but when I got an induction oven, I changed to frittatas," Brian said. "I can cook a frittata in the induction oven in just minutes. They're consistent, perfectly cooked, fluffy and light, with a nice brown on top, and made from cage-free eggs and all fresh ingredients," he said. Come summer, he'd like to add a Traeger smoker for burgers and the like on special occasions. "I like to cook because I had to," Brian explained. "I had a single mom, so I started cooking at home when I was nine or ten." Born and schooled in Bend, Brian worked as a line cook and then assistant manager at Jamie's Great Hamburgers, a family-owned chain. 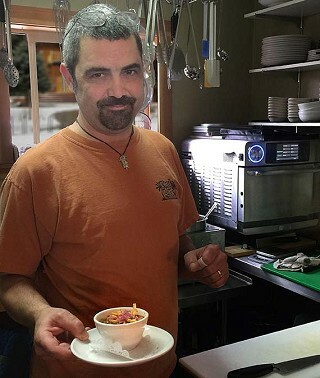 He continued with part-time jobs in restaurants while attending the University of Oregon and Portland State. "I started school as a music major, finished with a degree in general science and Spanish, and wanted to be an educator," he said. Instead, what followed was a series of jobs in restaurant kitchens including McKenzie's on Bond Street, Steak Out West, Club 97, and finally, the Pine Tavern, where he was the sous chef. He left the tavern to run a deli with a friend, but that didn't last long. "By that time, I was burned out and done with working in the restaurant industry," he said, "so I went into contracting and doing home inspections." Then came the recession, so when the housing business took a dive, he returned to part-time jobs at places like Ten Barrel, Blue Fish, and other family-owned steak houses. "I didn't go to culinary school, but I learned from really good chefs, and graduated from the school of hard knocks in the kitchen," he said. "Jim and Janet Brockway had opened and operated this business for a long time," he said. "It was a nice, ample space, the kitchen was small, but do-able, and at 50, I was tired of crawling under houses. It was time! I went back to my roots." He turned to longtime friends in the hospitality and restaurant industry for advice, and used his contracting skills to renovate the tiny kitchen into an efficient workspace. "It came together at the right time," he said. "I want to play in the kitchen," Brian said. "I want to have a good time. I know it will get stressful, but so far, it's not. I've lived the life of a full-time chef... and I won't go back to doing that." Good Day Café will be open Tuesdays through Saturdays from 9 a.m. to 4 p.m. with seasonal variations. The kitchen will be closed Sundays and Mondays, but the café will still offer drinks and cookies. Eventually, there will also be a selection of grab-and-go items in the small cooler. The café will remain open during Fourth Friday Art Strolls, as long as visitors keep coming.